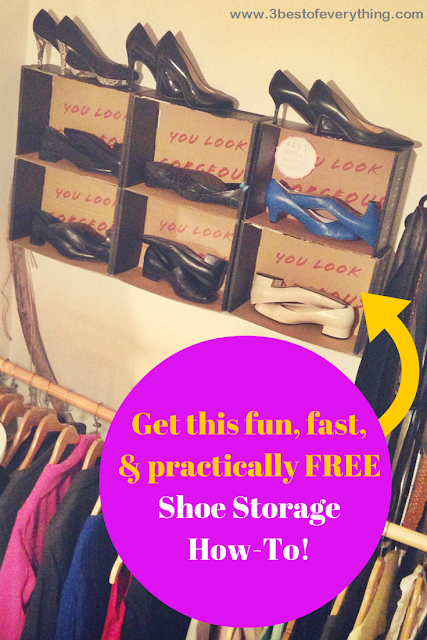 3 Best of Everything: Closet Organization DIY Idea for Shoes: Using Cardboard Boxes, in 3 Simple Steps! You could really do this same DIY using your own cardboard boxes as long as they're about the same size. READ ON TO SEE THE HOW TO VIDEO! Good closet organization can really help you feel calmer and happier when you're planning your outfit! I really recommend the LeTote boxes for this DIY because they really are the perfect size and are a lot of fun. Here is the full tutorial video! In this video, I show you how to fold and cut the box right for maximum sturdiness, and show you exactly how to attach it to the wall! Tip: Get the bigger boxes by requesting more outerwear or bulky items. This is so easy now that you can "switch" items into your cart! Here are the three simple steps! Step 3: Attach to the wall! Searching for other DIY's that will work with smaller cardboard boxes? Let me know if you have found any good ones! I certainly have enough cardboard boxes ready to go to try a few out! Did you love this tutorial? I would love it if you subscribed to my blog.